Here are three sets of “now and then” photos takes by Don Teuton that show just how much work has been done since the clean up and replanting of trees began. 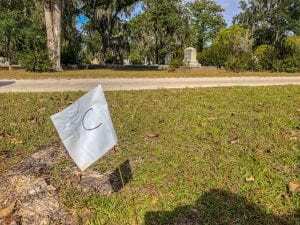 We often get asked how has Bonaventure Cemetery recovered since the hurricane? And the cedars populating the cemetery suffered the greatest damage. Some with trunks of 30″ diameter or greater were snapped like toothpicks by the winds. Like all things impacted by nature, recovery is a slow process. Bonaventure Historical Society voted to spend almost $7,000.00 to replace some of the trees lost in Hurricane Mathew. Don Teuton, BHS Vice Chairman reported “All over the cemetery are these white flags with letters on them. Where a Live Oak fell, it’s being replaced by another Live Oak. Where a Cedar fell, it’s being replaced by another Cedar.” This will cover the cost of replacing more than 50 live oaks and 20 or so cedars. Thank-you to all of you who have donated to the Bonaventure Historical Society or bought one of our apps. Your contributions make this all possible.